I rented my kayak from Fisheating Creek Outpost in Palmdale, and Mike dropped me—along with eight others—at the Burnt Bridge put-in around 9:30. This is the same paddle I did three years earlier, about 8 miles, 4 hours. On the way to the put-in, we passed through two locked gates and over the Lykes Brothers’ property. Mike pointed out a crested caracara sitting atop an old tree. He told us to watch for panthers in the fields as several had been spotted recently. I listened to the folks traveling with me as they chatted about snakes they’ve encountered on their paddles, and I cursed that I had left my snake knife in the car. We arrived at the put-in and piled out of the van, but stood aside while Mike first scooted a couple small gators away from the beach! Fisheating Creek flows into Lake Okeechobee, apparently the only free-flowing tributary that does. Paddling it, it seemed three different waterways to me. At the Burnt Bridge put-in, the creek was wide, tall cypress dripping with Spanish moss and air plants on each side. 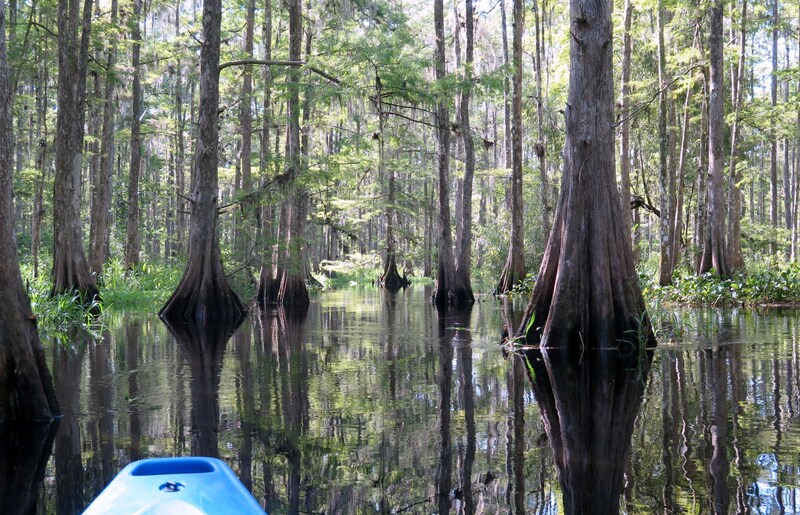 Within 30 minutes, I paddled into the cypress swamp and twisted and turned around the cypress and their knobby knees, trying to follow the swift tannin-colored flow. When I emerged from the swamp, I entered a creek, smaller than the original but with a more definite path than the swamp trail. Now, I paddled around grass islands. For the next few hours, my paddle continued in this manner with the ever-changing waterway. I love that Fisheating feels so wild! 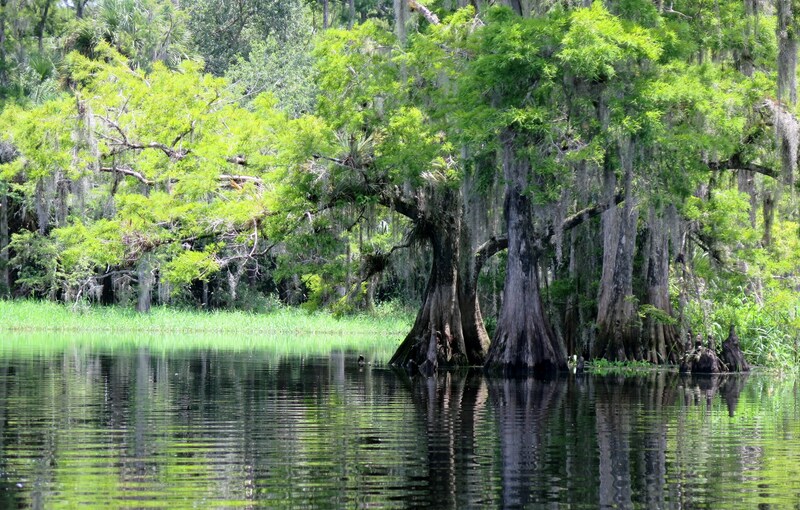 There are no homes along the banks, just beautiful tall cypress. Much of the creek lies within the Fisheating Creek Wildlife Management Area, purchased from the Lykes Brothers years ago. I heard few sounds other than the ibis honking loudly from the swamp floor. I paddled under the hot sun, appreciating the occasional cloud that gave me shade. A crested caracara flew overhead; a few small gators bobbed in the water as I passed; an anhinga stood on a log, scouting for lunch. Life was good. I just love Fisheating Creek—still an awesome paddle!